'F/8 and be there' used to be the golden rule when it came to photography. It doesn't quite fully apply to wedding photography however - I can't think of the last time I took a wedding photo of less than 80 people at an aperture of f/8. But the second part, the 'being there' part is still as important now as when the sentence was first said all those decades ago. Good wedding photojournalism isn't just about being in the right place at the right time; It's about knowing you need to be there in the first place. Being in the right place at the right time is a saying of luck and goof fortune, but you can't rely on those things when you're photographing the biggest day of someone's lives. 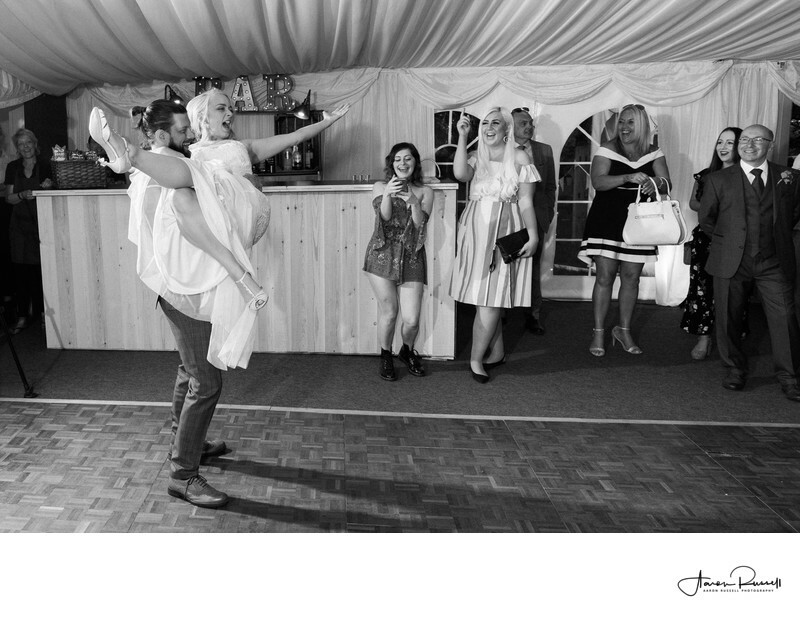 For this photo of Ben and Gemma during their first dance, I didn't know that the groom was going to pick the bride up and spin her around, but I did know that I needed to be exactly in the spot I was for the best chance of capturing whatever would happen. I chose to shoot from this position as I could see a few of the guests in the background were really getting into the spirit of the festivities and knew that including their reactions to anything that might happen would make for a stronger image.